This is a live blog post from ILTACon, the 2016 conference of the International Legal Technology Association. This session, #ILTA158, is Reinventing Traditional Support Staff Roles in a Buyer’s Market (#ILTACon Live) with panelists Florinda Baldridge of Norton Rose Fulbright, Scott M. Cohen of Winston & Strawn, Rachelle Rennagel of Pillsbury, Katrina Jasaitis of Mayer Brown. A session description appears at the end of this post. I wrote this post while the session took place and published as it ended. So please forgive any typos or mistakes of understanding. As a live post, please forgive any typos or misunderstandings of meaning. Since the economic crash of 2010, law firms find themselves in a more competitive market. It’s now a buyers’ market, not a sellers’ market. This has led to tech initiatives and process improvement. But these only get firms part of the way. As important are new roles and organizations to deliver support. The year 2008 led to very significant changes. In spite of the pain, it’s a good thing. It’s great that clients challenge firms to add value and be more efficient. Florinda got an email back then called “efficiencies”. The managing partner communicated to staff client demands to be more efficient. Also, clients increasingly use legal service providers instead of lawyers, for example LPO or accounting firms. Clients have also more transparency as well as value. This has driven alternative fee arrangements, budgets (and sticking to them), and the rise of professionals for pricing, budgeting, and project managers. The billable hour creates challenges but it is far from dead. ∂ These pressures mean support staff need to reinvent themselves. In a show of hands, more than half the audience have moved into new roles (RF: not clear over what time period though). Those who don’t reinvent themselves are at risk for their firms replacing them. Economics are not the only drivers of this – so too is the rise of tech. One panelist took responsibility for paralegals to help re-invent them and re-tool them. She built a 25-module training program to help. This was only moderately successful. The paralegals, in 2011, were not very willing to change. Even after pointing out to them that partners they were working for would retire in near future, they were not that motivated, From 2011, the number of paralegals fell from 25 to 3. Two of the three who remained embraced the training and third moved to an LPM role. But reinvention of yourself is not easy. There is much fear and intimidation. Some embrace change but many resist and fear change (and skilling up). One aid to reinvent is to look at your core skills and determine how they can be applied in different or new ways. Also, look to identify new or unmet needs and volunteer to start an initiative to address. Panelists says that firms will embrace those who offer to make improvements. But some lawyers may resist the change, especially if it is a lawyer who has re-tooled him or herself. More law firms are now hiring people who focus on the business of the practice. (And the clients are hiring directors of operations as well.) “Clients care about how the sausage is made. They want to know how firms run their businesses.” This drives firms to improve operations. To support this, many firms have developed new operational metrics. One firm did this and shared with a consultant, which came back with process maps to show firm where improvement opportunities lay. One panelists cites example from past of distributed library in a big firm. It found that reference librarians spent way too much time on technical services such as intake and shelving of books and not enough on research. Process maps, metrics, and analysis helped uncover this and make improvements. Technology underlies much of the above. It can force change. For example, third parties are using tech to collect, aggregate, and analyze law firm data and reporting to clients, which can then assess law firm relative efficiency. In discovery, computer assisted review has dramatically changed how reviews are conducted and how many lawyers are needed. 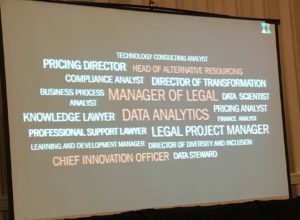 Law firm operations are adopting new technology, for example, a Tableau-powered partner financial dashboard. A related issues is when firm should insource, outsource, or open a low cost service center. In show of hands, not one goes up in answer to ‘how many of your firms are looking ab the build v buy decision’. Panelists are surprised. Only a few hands go up for doing so in recent past. One panelist discusses her firm’s low cost service center. To some extent, decision depends on culture and partner preferences. At the same time, economic pressures are also changing culture, for example, yanking decisions from executive committees to professional staff. But client economics may require finding a way to lower costs. The transition to offsite (outsourced or insourced) requires learning new ways to manage staff and teams. Norton Rose Fulbright panelist discusses how the firm outsourced its document processing services to Manila. This was a “high touch” firm where partners expected immediate action. Counters audience member comment that you don’t outsource in a high touch. In fact, panelist says outsourcing created better service levels. So she says outsourcing can be consistent with high touch cultures. I ask about ∂ use of service level agreements and metrics to decide among insource, outsource, or low cost centers. One panelists agrees that SLA and metrics did drive the decision. One firm has several data scientist / analysts, which they did not expect to see in their lifetime. To some extent, the rise of many new professional staff has confused some lawyers, who now are confused about what they should do versus delegate. I was a paralegal. Early on, because I changed printer cartridges, I was tagged as tech savvy and shifted to a tech role. Eventually, I transitioned to project management. When I saw an opportunity to get involved in practice management, I grabbed it. I’ve been at my firm since 2000 to build practice support and e-Discovery departments. Technology has long been a theme. I made it my goal to identify the firm’s goals and needs and tried to position myself to help meet that. I saw the firm was aiming to be national counsel on mass litigation. That made having good EDD tech key. I had to solve for that problem. Having 16 years in one firm has been fun because of a great team, a series of different projects, and the ability to drive the direction the firm support staff roles and functions. I was a lawyer (and still am). When I wanted to take a different path, I deconstructed my own skills. Then I spent a lot of effort / introspection to write my own best job description. Then worked on trying to achieve the objective. I couldn’t do so at current firm so I had look elsewhere, at other firms and other sectors. I had to build my own roadmap. Talk to vendors, go to conferences, talk to peers, take classes, and build your own roadmap to reinvent yourself. A big value of ILTA is to enable this process – it is the village that supports the journey. 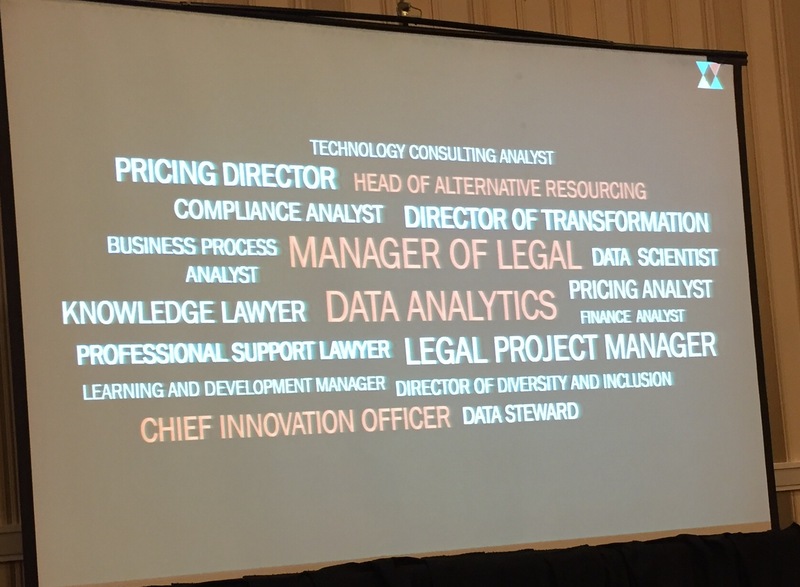 The composition of roles within the modern law firm is rapidly changing. In today’s buyer’s market, client demands require law firms to redefine traditional support staff roles, such as paralegals, legal secretaries, legal clerks and law librarians. Law firm industry experts will discuss how technology and the success of practice support departments can instruct us on how to achieve radical change in other operational areas affecting the business of law and the bottom line. Learn how to turn market challenges into professional development opportunities and realize greater profitability.